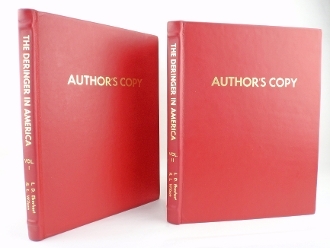 Signed leather "Author's Copy" of The Deringer In America Volume One The Percussion Period & Volume Two The Deringer In America Volume Two The Cartridge Period. Authored by R.L. Wilson & L.D. Eberhart. Two volume set in nice condition. Both signed copies are to notable fellow author Nelson Perry. (Nelson Perry wrote Gold Colts: A Tribute to Gustave Young). Every serious small gun collector will need these two volumes for reference. Collectors set.